The term arthrogryposis describes a range of congenital contractures that lead to childhood deformities. It encompasses a number of syndromes and sporadic deformities that are rare individually but collectively are not uncommon. Yet the existing medical literature on arthrogryposis is sparse and often confusing. The aim of this book is to provide health care professionals, individuals affected with arthrogryposis, and their families with a helpful guide to better understand the condition and its therapy. With this goal in mind, the editors have taken great care to ensure that the presentation of complex clinical information is at once scientifically accurate, patient oriented, and accessible to readers without a medical background. 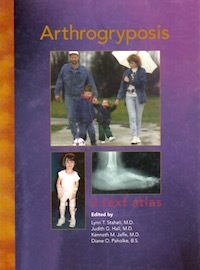 Commended at the 1999 BMA Medical Book Of The Year Awards, Arthrogryposis: A Text Atlas is authored primarily by members of the medical staff of the Arthrogryposis Clinic at Children's Hospital & Medical Center in Seattle, Washington, one of the leading teams in the management of the condition, and will be an invaluable resource for both health-care professionals and families of affected individuals. All cover photographs used by permission. Family photograph by David Goetze. by Ribera (1642), reproduced by permission of the Louvre Museum, Paris. For more general information about arthrogryposis, please see the The Arthrogryposis Group (TAG)'s web-site at www.tagonline.org.uk.